Offers enough tools for basic use but it's sluggish at times and the audio-management facilities are not up to much. Windows Movie Maker first saw light of day in 2000 when it was introduced along with Windows Me. Both the mother OS and the application itself were not well received, the former blighted by technical glitches and the latter by a woeful lack of features. Windows XP fared better and with it was bundled v2 of Windows Movie Maker, which supports authoring of WMV8 and AVI files and can handle DV. In 2005, we saw Windows Media Centre Edition and WMM2.5 which can be used for burning DVDs. Back to the present day and we've a variety of WMMs floating about. For those without Pixel Shader 2.0 support in hardware (a pixel-rendering facility needed to run Windows Vista properly), there's 2.6, while Vista Starter laggards can enjoy a version-hopping v6 that supports standard-res video. Windows Vista Business users, meanwhile, should be getting on with their work, hence WMM6's HD handling is not for them. Users of Vista Home Premium and Ultimate, though, have the means to capture and manipulate high-definition (HD) video from the latest camcorders and publish it in a variety of forms. And the questions that such folk are bursting to ask include 'does this latest freebie represent a major improvement on its predecessor and obviate the need for a commercial, entry-level NLE suite?' Well, in a word... doubt it. The interface is very much improved, reminiscent of Windows Media Player 11. The layout is logical and clear, with oft-accessed facilities in the Tasks list at left, although you can switch this off because everything it contains also features in the dropdown menus at top. A resizable preview window with transport controls features at right and imported media is shown as icons at centre. Import options are extensive. Video-wise, most popular formats can be hauled in, including DVR-MS, Microsoft's TV-recording format. There's native support for editing MPEG2, too, which is the format used by HDV camcorders and for commercial DVD releases. Compressed and uncompressed audio can also be accessed, including the usual WAV and MP3, although while AIFF is OK, Apple's AAC format is not supported. It's when capturing footage from DV tape that a real niggle arises. To test the efficacy of WMM6's capture facilities, we used a standard-res Panasonic NV-GS280 and a HDV Sony HDR-HC3. Both plug into Vista via FireWire with no complaint about drivers. Just plug them in, switch them on and 'Your device is ready to use'. With the Panasonic, we're offered the option of importing everything on the tape as a single file, or as individual scenes. Hence, every time the Record button is pressed, then recording is stopped, that take will show up as a single clip in WMM's Imported Media window. Behind the scenes, the footage is still one file, but it's handy to have the software show a bunch of pre-chopped clips. With the Sony, there's only the option to import everything recorded on the tape as a single MPEG. This is more to do with the way the hardware talks to Vista and the application, but it makes for a lot of 'footage hacking' during the edit. As with many NLEs, putting a production together is but a case of dragging and dropping clips into the Storyboard or Timeline along the base of the interface. The latter is for fine-tuning the length of each clip, but this is made somewhat tortuous by the slow-ish rendering of the Preview window, even when WMM is installed on a nearly new, well-specified Vista machine with very little else running. Frame-accurate cuts can be accomplished by nudging the playhead with the J and K keys, or the icons beside the Play icon, but you have to be patient and let the frames render before hitting M to split clips. You can see what's going on with audio embedded in the video clip - it's displayed in its own lane - and there's another track for dropping in audio files, or for recording narration. However, you can't narrate over an imported audio segment. If you want to add a voice to the production, either choose a section where there's no imported audio, excepting that which is embedded in the video, or use a dedicated multi-track wave recorder to pre-author before import. Switching to Storyboard view makes it easy to drop in any of 63 transitions and 49 effects between and on top of clips. Most are pure cheddar, but the same can be said of many such collections. At least the duration-adjustable Fade transition, plus Fade In From/Out To Black and Grayscale effects, are there. And titles and credits, plus overlays, can be created and applied, accessing whatever fonts are on your system, in order to top, tail and punctuate the production. Output options are good, with support for various computer-orientated formats from low-bandwidth WMV up to Windows Media HD 1080p, as well as a wizard for burning to CD-R, and the means to port the production into Windows DVD Maker so as to author menus for DVD-R.
A one-click optimiser for email also features, although it's a shame there's no wizard for outputting and sending direct to accounts on such video-hosting sites as YouTube and MySpace. 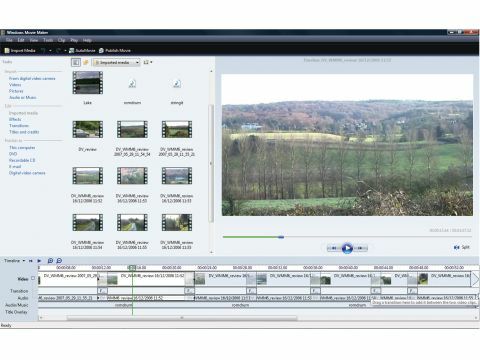 While Windows Movie Maker 6 is a step on from its predecessor, and is very easy to use, Microsoft could do with addressing the efficiency of its rendering, its audio capabilities and online integration before dreaming up additional transitions and effects for the next version.